Mako Group is an interesting Israeli company with a long history of producing some very innovative combat proven accessories at extremely competitive prices for the Israeli and other special operations forces around the world. Their designs are no-nonsense light, slim and trim without any “Tacticool” frills. Every nuance of their designs have some proven and tested tactical reason. While upgrading my Aero Precision build with White Oak barrel, Young Machine M16 Bolt Carrier Group, Geissele Trigger, Syrac Ordnance adjustable gas block, and PRI quiet brake I decided on using Mako grip and stock on this high end build. While I was cruising The Mako Group’s site, I added their single point sling, 5.56 magazine pouch, and detachable sling to the order. In the past I have been very pleased with the quality of their innovative common sense designed components such as the grip and recoil reduction stocks I have reviewed previously. This stock is a direct replacement for any sized buffer tube; commercial or mil-sepc. The GLR16 has an internal self-adjusting tension system which allows the stock to fit or be swapped between a commercial or Mil-Spec buffer tube. Another advantage of this feature is that it is a rattle free stock. Along with a quieter stock, the very trim design of the GLR16 has a built in storage compartment for two CR123A 3V lithium batteries or two AA batteries and will hold either battery type without any rattles. 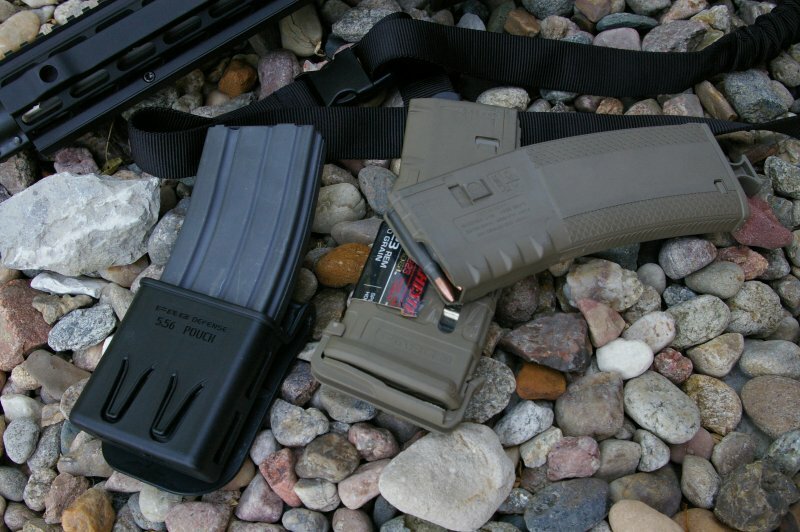 As with the previous Mako Group stock I reviewed, the chevron rubber but pad offers a nice cushion and very secure mounting surface whether you are wearing a t-shirt or body armor. 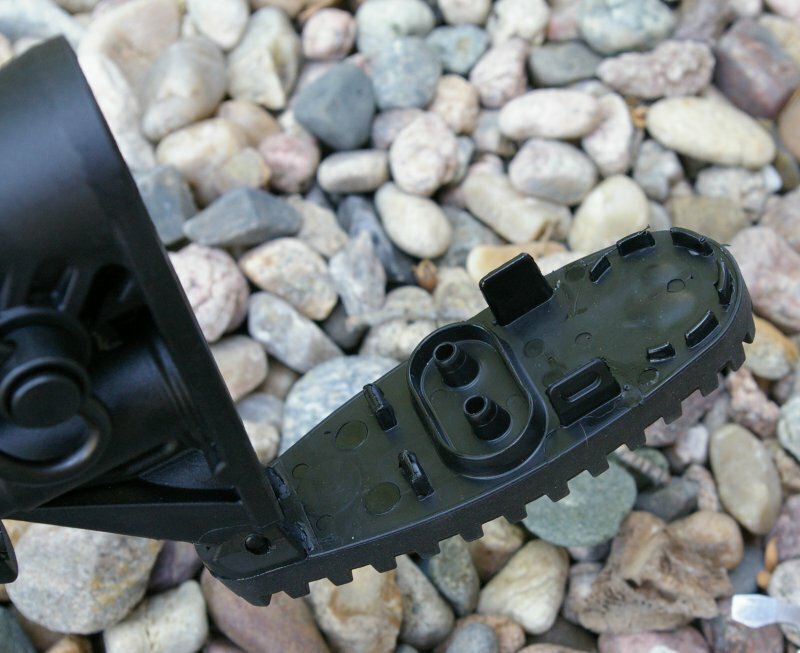 The Mil-Spec reinforced polymer composite body is very tough and uses steel hardware but still remains only 9.7oz. If you have a sling, you will have plenty of attachment points; the GLR16 has six total attachment points for single, 2-point, and 3-point slings. Just a note that this is such a well regarded stock that it is the standard issue for Israeli Defense Forces and is the stock used on one configuration by SIG on their SIG 556 rifle. So let’s put this stock head to head with the Magpul MOE Stock. 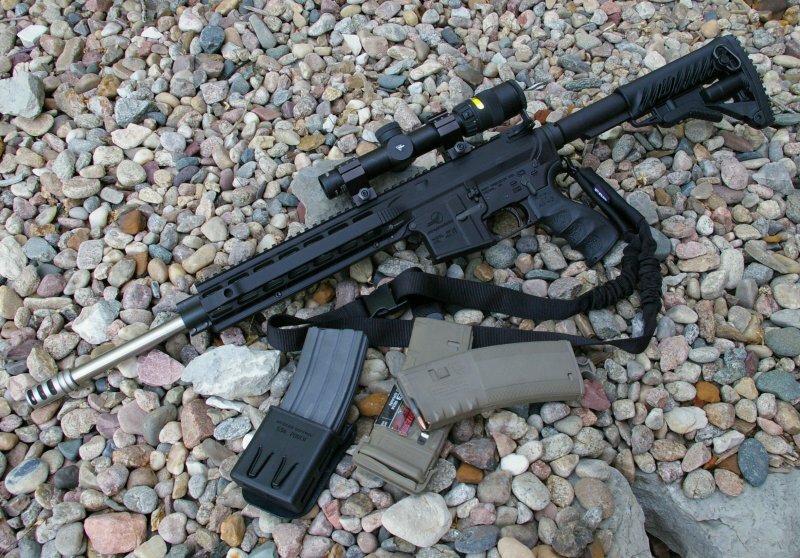 Yes the MOE stock is less expensive by about $25, however the Magpul is 12 oz, the GLR16 is 9.7oz. The MOE does not have any internal storage, the GLR16 does, the MOE has not QD-sling mounts, the GLR16 has two. 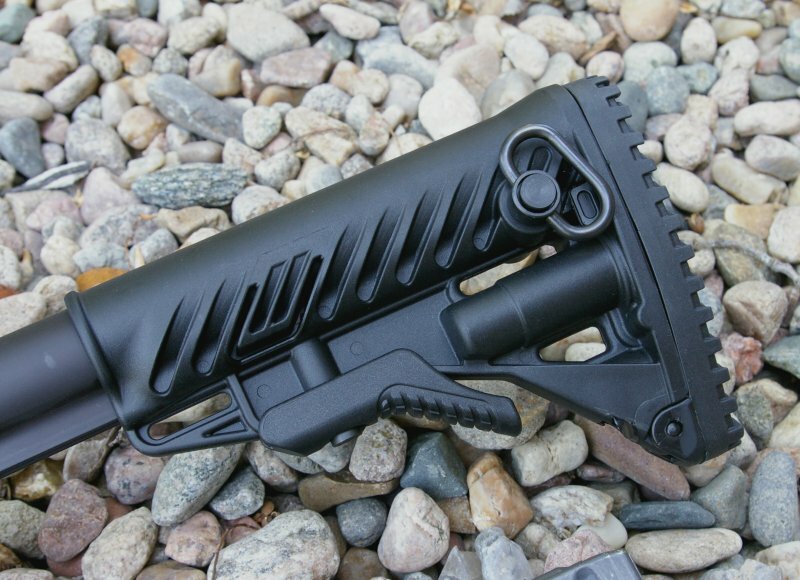 The Mako stock even has more sling attachment points all while fitting both mil-spec and commercial buffer tubes and being completely rattle free. I like my Mako MOE stocks however this is a lighter and more full featured stock all the way around. I have been considering doing a little 3-Gun shooting and tactically I like the features of the single point sling. The problem is that static single point slings can be a bit brutal on the shoulders in just a T-shirt. After talking this over with my buddy who is DOD Special Operations, he indicated everyone uses a bungee style sling to improve comfort and prevent restriction of movement. The Mako Group Tactical Single-Point Bungee Sling is a steal for only $22 and provides all the features I was instructed to look for. It features a bungee section for comfort and movement, steel snap clip and bungee section are shrouded by webbing for quiet operation, easy adjustment, and quick-release buckle allows sling to be removed without taking it over the head which is a feature useful when worn under a jacket or if an injury occurs. The sling works as advertised, however my one complaint was an inability to swap out the clasp for a QD-mount, or other style clasp. 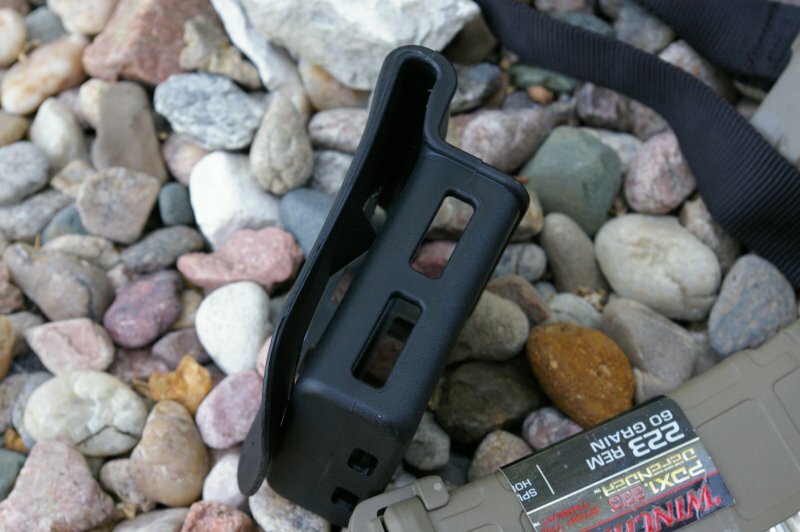 The steel clasp is securely sewn in and prevents the swap to QD or other type sling mount. 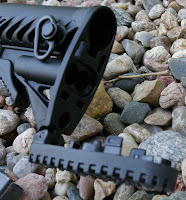 Actually I ordered the QD-Sling mount stud thinking I would be able to swap the clasp. 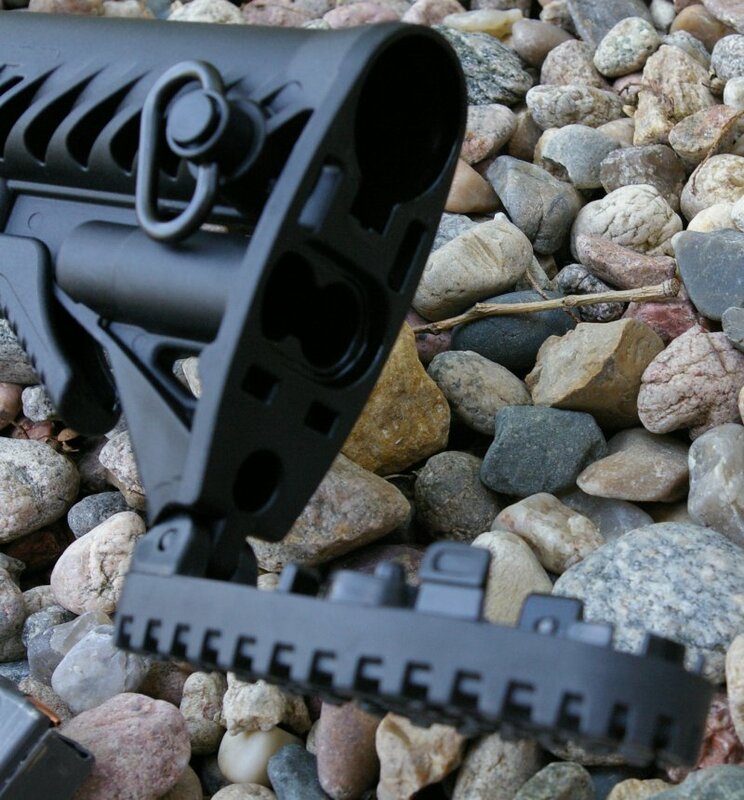 For those rifles which have a ring style single mount buffer tube plate mounting point such as the Phase 5 Tactical Revolution mount shown, this sling works very well and has been completely indestructible, comfortable and very quiet. 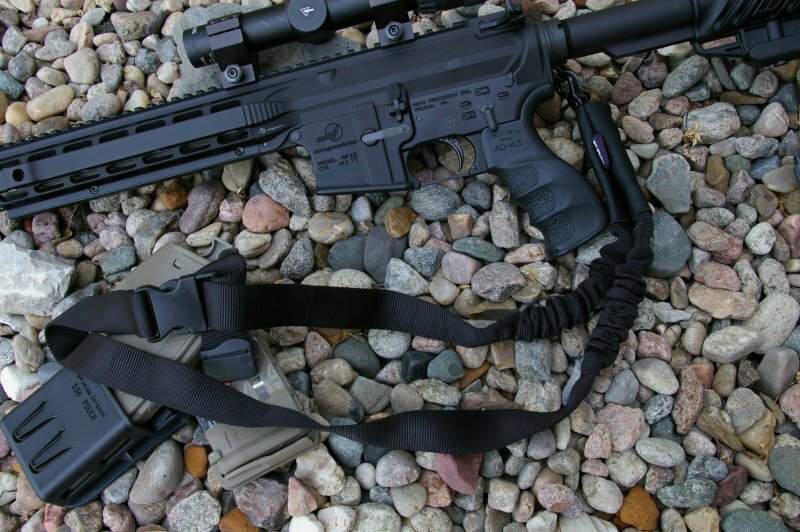 All around a feature rich inexpensive single-point sling I would buy again to dedicate to other rifles. In my consideration of wanting to start shooting 3-Gun, I have been looking around for an inexpensive way to holster up several AR15 magazines and did not want to jump right in with a complete $400 Safairland 3Gun rig. Let me tell you that the 3-gun craze has not made this type of accessory a cheap item. 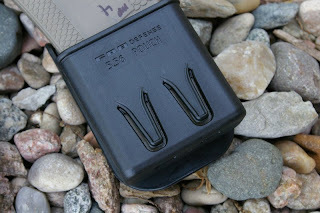 Then I stumbled on the $22 Mako Group 556 Pouch which is so freaking simple I am ticked off I did not think of it. 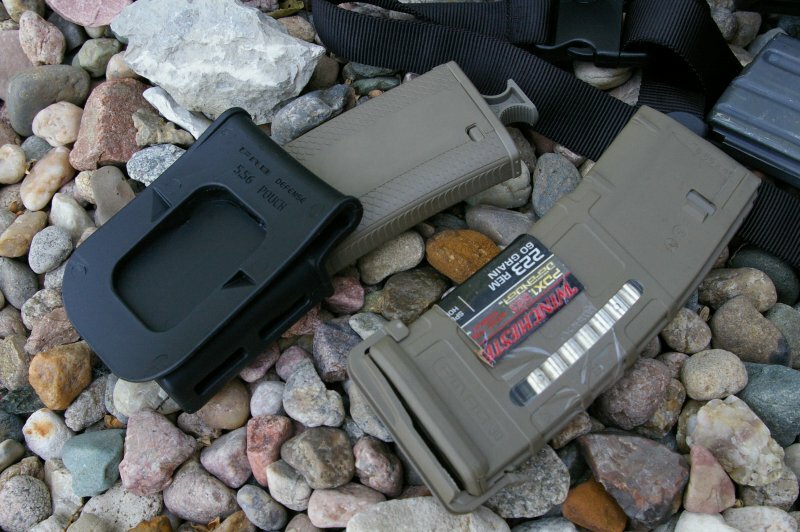 The 556 Pouch/magazine holster was designed as a quick grab and go and/or under cover option where a duty belt would be too slow to attach, cumbersome, be too noticeable. This is a superbly executed and inexpensive accessory which I am sure the 3-Gunner crowd would eat up. The clip works the same as a paddle style holster and securely clips into the pants or shorts over the belt. I have found that it also holds very well even when clipped into drawstring shorts which you will find me in on super hot range days. 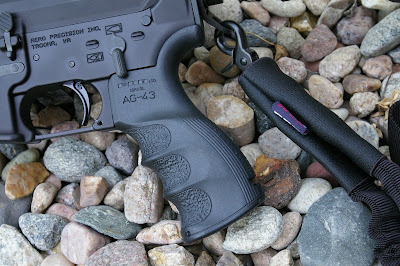 With this key slip on feature in mind, it is a very valid personal defense accessory to your AR. I was interested to see how the pouch worked with various types of magazines and have had no issues with Mil-Spec, Magpul, or Troy magazines. More importantly, the 556 Pouch is super comfortable and with a wider 1.5” loop width belt, several could be worn for competitions or for training. I have also extensively used this Mako Mag Pouch holster to train with my S&W M&P 15-22 and it holds those magazines as well. I need several more of these to dedicate to each of my rifle’s kits... this super simple design is really pretty awesome and for $23, that this only the price of a magazine. Mako QD Sling Swivel – SLS – QD sling mounts are all the rage and are now becoming more prevalent than ever, so in my opinion you can never have too many. The CNC machined steel QD Sling will mount to any Mako QD equipped buttstock or to any quick release socket which are standard sized. The idea is simple, push the center button, insert the swivel and the swivel locks in place; to remove the swivel push the button again. There are various loop widths available on QD slings however Mako only offers the 1.5” width loop which is compatible with the vast majority of slings. I have seen people charging exorbitant prices for QD swivels however $12.80 MRSP is very competitive. I have used this grip before on my DPMS 7.62x51 AP4 build and have liked it so much much that I decided to use one again on this build. You may have seen similar “ergonomic” grips before however this one will not leave your hands blistered as I have experienced on other competing models. Let me tell you that if my AP4 is drastically more comfortable to shoot long-term, then your AR15 will be as well. Mako notes the pistol grip provides an improved shooting angle, better control, less slipping and less wrist fatigue than other grips. The grip proved itself to me on the big AP4 and again on this upgrade. On my AP4 the grip did have a little gap at the top of the beavertail due to the different 308 platform, however it fit perfectly on my mil-spec Aero AR15. The beavertail added a lot of comfort for me and seemed to position my hand higher and more comfortably to control recoil. To pick on Magpul again, I have had one situation where my grip compartment auto opened running standing to prone firing drills with an AR15, however that will likely never occur on the AG-43. The Mako AG-43 required a bullet tip or screwdriver to pop open the grip storage compartment which at first I didn’t like, but now I prefer it. 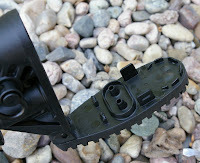 Generally you are not putting things in the grip you need quick access to, but backup parts which may never get used. My only regret was not buying this grip and the stock in FDE as I seem to getting a little tired of an all black rifle. Again The Mako Group impresses with competitively priced products. If you are looking for Tacticool products, then Mako’s designs may not appeal to you, however as a guy how has trained with real life Isreali Special Forces guys, these guys and their equipment are the epitome of the phase high speed, low drag. This “everything to do the job and nothing more” design attitude carries through the Israeli Mako Group’s products. The question should be; do you really need anything more?